Nestled on four acres of waterfront headland in the southern Tasmanian village of Woodbridge, Peppermint Bay has commanding views across the d’Entrecasteaux Channel and north to Mt. Wellington. Peppermint Bay is open 7 days a week for bistro dining, featuring local and regional produce, light meals, coffee, tea and freshly baked fare. 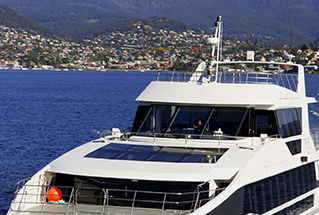 With the option of cruising down the River Derwent on a 23 metre catamaran, Peppermint Bay II, experience the real Tasmania by water or a 40 minute drive from Lenna of Hobart.